Is Bedtime Dangerous for Black Babies? According to a recently released report by Delaware’s Child Death, Near Death and Stillbirth Commission, unsafe sleeping practices, like sharing a bed with an adult, are to blame for more reported infant deaths than in past years, particularly among ethnic minorities. 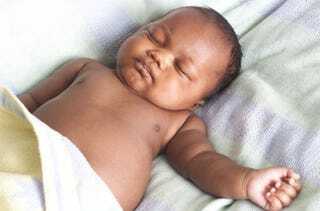 NewsWorks reports that the commission released its fiscal year 2010 report Monday with the troubling statistic that of 18 infant deaths in the state attributable to unsafe sleeping, 15 — that's 83 percent — were African-American babies. Six of the infants were not sleeping on their backs. Four of the cases involved unsafe bedding for the infant's sleep, and in two, mothers fell asleep while breast-feeding their infants. Clearly the numbers here are quite small, and the accuracy of the theory that cultural practices and economic reasons explain the disparity is up for debate. But this is one of those cases in which the solution to the problem is much more important news than speculation about its cause or assignment of blame. "What I like to tell parents about the safest sleep environment is the ABC's. The baby should be sleeping Alone. B is for sleeping on his or her back, and the baby should be sleeping in a Crib," said Kate Cronan, an emergency room doctor at A.I. duPont Hospital. One preventable death of an infant (of any race) is too many. So take note. Read more at News Works. In other news: Tea Party Turns on House Speaker Boehner.